"Einstein is no different than Tiger Woods, or Bill Shatner, or Boutros Boutros-Ghali." Full confession: I hate the Olympics. It's a quadrennial celebration of the stupidest kind of jingoism combined with sports that no one cares about. Goodness knows I recognize that mine is a minority opinion, but as a rule it's events like curling that confirm my anti-Olympian prejudice. At first blush it looks like some unholy union of shuffleboard on ice with custodial responsibilities—can this possibly be what the ancient Greeks had in mind when they began their Olympic games? 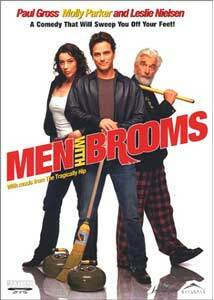 But Men With Brooms has a real goofy sort of charm, in no small measure because it displays a love of curling, and perhaps more important, because it takes many of the best-loved sports movies and refracts them through a Canadian prism. I'll still probably graze on by when this sport shows up again on television, but this is a smartly made and entertaining little movie. It's kind of a rough opening for a comedy: out on the lake with one of his daughters, Donald Foley, coach and lover of curling, has a heart attack and dies. His last will and testament includes a peculiar codicil: he wishes to be cremated, and have his remains placed inside a curling stone; and he wants the team he coached ten years ago to reunite, to make a proper run at the Golden Broom of Long Bay. Will the boys abide by the dying wishes of their beloved coach? The straw that stirs the drink here is Paul Gross, who shares credit on the screenplay, directs, and plays the leading man—he's Chris Cutter, who's been out of town for years, after leaving one of Foley's daughters, Julie (Michelle Nolden), at the altar; Julie's sister Amy (Molly Parker), a single mom struggling with sobriety, still carries a torch for her sister's former fiancé. Getting jilted has launched Julie into an improbable new career: she's an astronaut, though an alternate for an upcoming journey on the space shuttle. Chris rallies together the other three members of his curling team: one of whom is in a hideous marriage and works as a mortician; another of whom is panicking about his low sperm motility and the difficulty his wife is having getting pregnant; and the last of whom is more than a casual drug dealer, with a girlfriend whose name he just can't seem to remember. (There's more than a passing nod to The Full Monty here, as you can probably imagine.) It's Chris's job to re-form this motley crew and turn them into champions, but he can't do so without the help of his estranged father, played by Leslie Nielsen, who seems to be getting increasingly batty in his dotage—he's now partial to the hallucinogenic mushrooms growing in his barn. The climax and resolution of the story isn't chock full of surprises, but it's pleasing to see the story play out, and Gross hits the right notes; the story is certainly satisfying, though it's got an undeniable familiarity to it. Gross also deserves kudos for making the seemingly arcane rules of his sport clear to the uninitiated, and even if you're jaded about sports and baffled by this one, it's hard not to cheer for the boys in their efforts to do right by the old man. Image Transfer Review: A competent transfer, with little interference, though the colors tend to be a little garish and glossy; maybe that's to compensate for so many scenes shot on the ice and snow. It's not an especially pleasing visual experience, and the constraints of the production budget are evident, but the movie comes to DVD looking pretty clean. Audio Transfer Review: If the sound of a curling stone schussing down to its target, guided along by the helpful scraping of a pair of brooms, puts goosebumps on the back of your neck, then you'll be delighted with the 5.1 track. It's a pretty sophisticated mix, actually, for a film that doesn't have a lot of inherent production values; during the climactic tournament, the dynamics are a bit out of whack, with the musical scoring blistering through the speakers. Otherwise, it's a good, straightforward mix, with more variety and nuance than the 2.0 track. Extras Review: The first featurette (04m:29s) is an interview with Paul Gross, in which he talks about growing up an Army brat, attending the University of Alberta, and the dedicated fan base of his short-lived television show Due South. The second (05m:24s) offers brief clips with interviews of other members of the cast, as well as with producer Robert Lantos. They're not especially informative, but golly, those Canadians are so dang nice. An unlikely and not necessarily appealing premise is carried off with style here, thanks to the movie's demonstrated love for its sport and fidelity to some tried-and-true sports-movie conventions. If you just can't wait for the 2006 winter games, then this is for you; and even if you take a pass on the Olympics, you'll probably be won over by this winning little picture.